SpaceSpace » Nature on the ropes. . . Nature on the ropes. 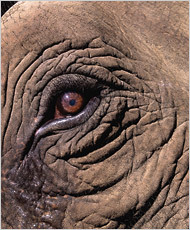 . .
Amazing bizarre and depressing article in the NY Times Magazine on the “Elephant Crackup” in Africa. These beautiful creatures, seeming pushed passed the breaking point, are exhibiting symptoms of PTSD, and are basically flipping out. All across Africa, India and parts of Southeast Asia, from within and around whatever patches and corridors of their natural habitat remain, elephants have been striking out, destroying villages and crops, attacking and killing human beings. In fact, these attacks have become so commonplace that a new statistical category, known as Human-Elephant Conflict, or H.E.C., was created by elephant researchers in the mid-1990’s to monitor the problem. In the Indian state of Jharkhand near the western border of Bangladesh, 300 people were killed by elephants between 2000 and 2004. In the past 12 years, elephants have killed 605 people in Assam, a state in northeastern India, 239 of them since 2001; 265 elephants have died in that same period, the majority of them as a result of retaliation by angry villagers, who have used everything from poison-tipped arrows to laced food to exact their revenge. In Africa, reports of human-elephant conflicts appear almost daily, from Zambia to Tanzania, from Uganda to Sierra Leone, where 300 villagers evacuated their homes last year because of unprovoked elephant attacks.